Fashion, statements, and expression. These are all terms that define jewelry. But our favorite gems are not immune to being damaged by accidents, improper care, or simply the ravages of time. We have all seen them: ‘Tooth paste for your silvers’, ‘lemon juice for your gold.’ The list of DYI jewelry maintenance is endless. But what works for those specialty jewelry? You can ensure that your jewelry lasts longer–perhaps even a lifetime!–by avoiding the following all-too-common jewelry myths which can actually damage or even irreparably destroy your favorite pieces. One of the most common mistakes people make with their jewelry is simply tossing it on a box or drawer without a second thought. One DYI project is converting an old box into a storage unit. But is this an effective and efficient way of storing jewelry? Let’s look at a couple of examples found here. These are VERY cute ideas! However, many of these projects can lead to tangles and scratches, just to name two problems. Most of these also leave precious metals open to air, which often leads to oxidation. 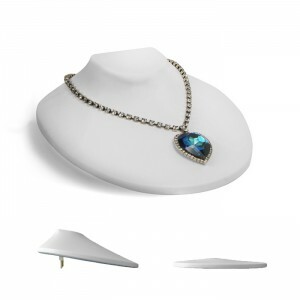 You need to purchase special jewelry packaging and other display solutions which will keep necklaces from getting tangled, rings from getting scratched, and fine metals from oxidizing. Jewelry packaging comes in many shapes and sizes so be sure to research the best type before you buy. Here are some GREAT solutions Gems On Display offers for jewelry storage and counter displays. The DIY myths do not stop at mere storage either, most likely you have come across many do-it-yourself jewelry cleaning solutions such as using dish soap, toothpaste. Here is an example of a DIY cleaner. The basic ingredients include: vinegar and oils. Vinegar should NEVER be applied to fine metals or pearls. Vinegar is an acid that erodes away metals and removes finishes. This is a very HARSH method of cleaning. Your metals may shine for a day or two, but oxidation WILL yield its ugly head. 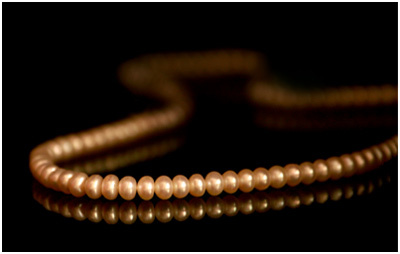 Costume jewelry would fair the worst with this cleaning method, as acids erode the finish. A better alternative is sticking to a gentle cleaning solution. 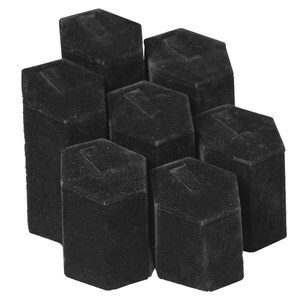 We offer many options as far as jewelry cleaner is concerned such as Realm Jewelry cleaner. 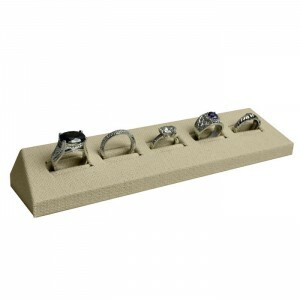 This is easy on fine jewelry and gems, and even includes a brush for those hard to reach nooks. Follow this gentle cleaner up with a polishing cloth, and any piece will be restored to its original beauty. 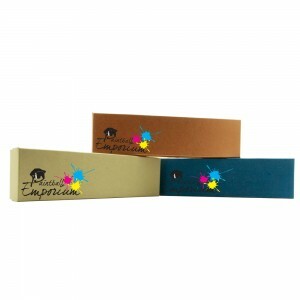 Getting your logo printed on your jewelry boxes is one of the best ways to carry your brand from store to street. 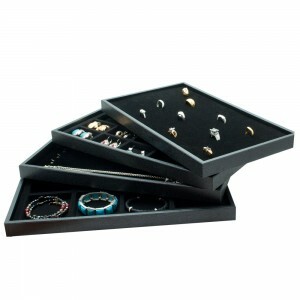 By having your logo printed on the boxes you give to your customers, your company name will be in their minds every time they see the jewelry box. The more familiar people are with your brand, the more likely they’ll be to remember your name for future purchases. Although there are many ways to have effective branding, custom logo printing is a great place to start or a way continue with your branding. 1. Create an account and log in. 2. Upload or create your logo here (don’t forget to name your logo!). 3. Go to the product you’re wanting to attach your logo to, click the drop down menu under the “Add Your Logo” icon and select your logo to attach it to the product. 4. 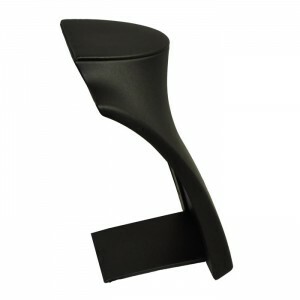 Add the product to your cart and continue to checkout or return to shopping. Our graphic designer will be in touch with you via email with a mockup of your logo on the product you’ve selected. If you have questions about custom logo printing, please call 1-888-317-2213. *This price does not include the price of the boxes. As summer is winding down and fall is almost upon us, it’s time to start thinking about the holiday season that is rapidly approaching! It’s time to get ahead on holiday planning, and we know one of the big things on that to-do list is getting your packaging products lined up and ready to go. Let’s take a look at the packaging products we have to offer, and some of the most popular choices for holiday gift packaging. Choosing the right merchandise bag is important. You want something that reflects your branding well, but that also reflects the fact that it is the holiday season. 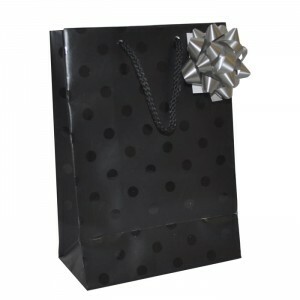 We offer a selection that ranges from paper merchandise bags to high end gift bags–all in a wide variety of colors and styles. 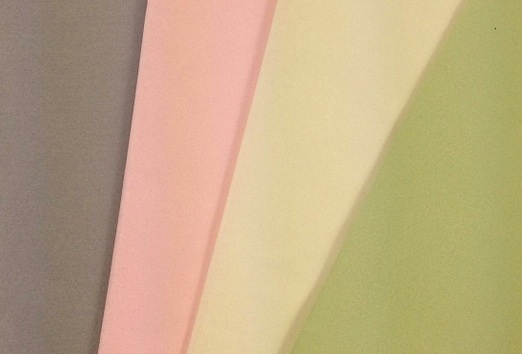 Choose a tissue paper that complements your gift bag of choice! The addition of tissue paper really makes purchasing special for your customers. Even if the purchased item isn’t for them, they will feel like they are getting a gift. Also, with the addition of tissue paper, they have a ready-to-gift item. Being able to have the gift wrapping already taken care of means a lot to holiday shoppers. Along the same lines as tissue paper, a bow really makes your packaging special during the holidays. Browse through our selection for bow and bag pairing options to find the color combo that matches your branding! 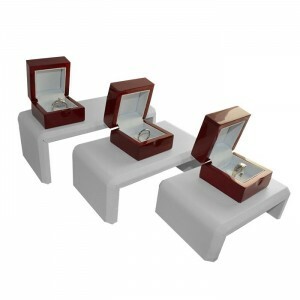 Last, but certainly not least, jewelry boxes are very important! From gold and silver cotton filled boxes, to the luxury wood boxes, we have you covered. 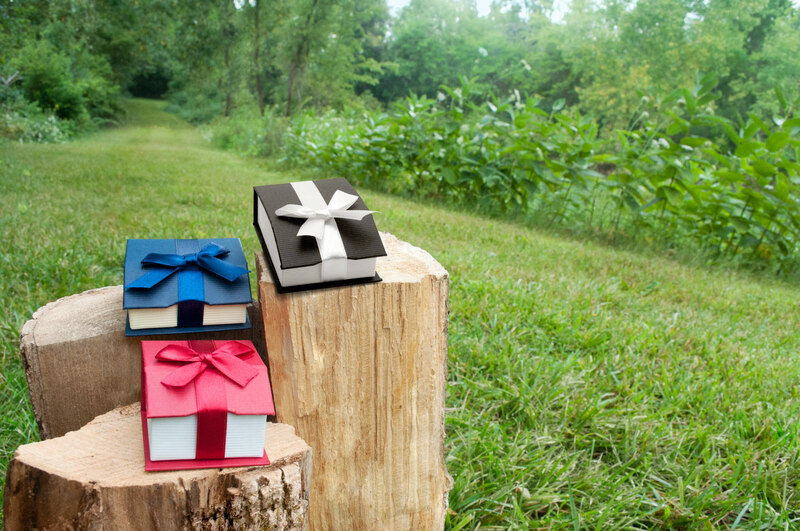 One of our most popular options for holiday shopping is the Magnetic Ribbon Box Series. This series has three color options, including a red and white option that is perfect for the holiday season. 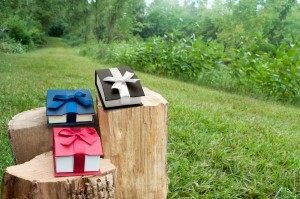 These high quality paper boxes already come with a ribbon and bow, making them the perfect choice for an instant gift. The case is our largest water-resistant canvas case that has wheels for easy transportation, a pull-out handle, and space for 17 1″ trays. 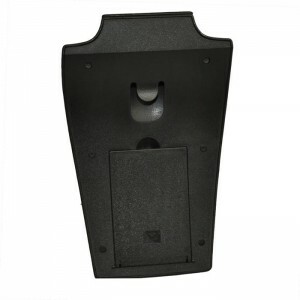 The 91-4A is a side-loading case has a dual zipper to make placing trays in the case a breeze. 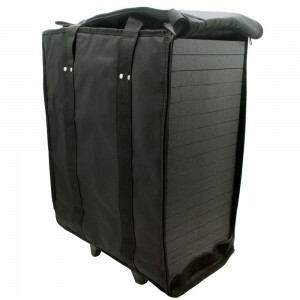 This case also folds down compactly for easy storage. Here’s the real time-saving part of the Kit–it comes with (17) of our popular TY-0011-BK 1″ plastic stackable jewelry trays and (17) assorted tray liners. The included inserts are as follows: (2) 96-07 (BK), (2) 96-08 (BK), (2) 96-10 (BK), (2) 96-18 (BK), (2) 96-24 (BK), (2) 96-50 (BK), (2) 93-1 (BK), (2) 92-72E BK, (1) 68-H-BK. All your jewelry needs will be covered with this assortment of liners! Travel Tip: Worried about your jewelry staying safely in place during travel? 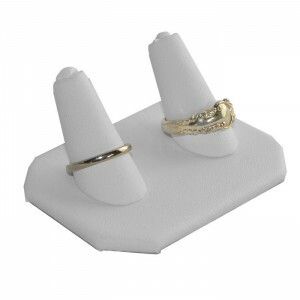 Our foam ring liner (item 97-72E) doubles as a protector when placed over your jewelry! Learn all about it in our Jewelry Show Tip video on YouTube! When you’re traveling to shows all summer, you need a display that makes traveling and setting up as easy as possible. After all, the less time you spend setting up, the more time you can spend selling. In addition to necklace easels, we have a couple of options for traveling necklace busts that are also great choices for displaying on the road. What travels light, pack nearly flat, and makes your life easer? This bust has a pop-out back. Packs almost flat for easy traveling. And it doesn’t stop there. 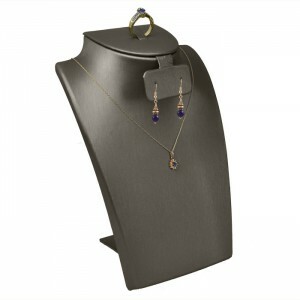 Try a combo traveling bust to display jewelry sets! Showing your customers pairing options in one place is a great way to get a bigger sale. 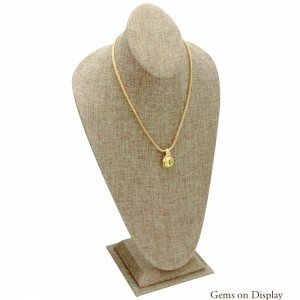 The traveling necklace bust is also available in several other options, including a tall necklace display. Need a display with less height? Another fabulous options for traveling is this pop-up necklace display, which packs flat and pops up to create a low profile bust. It works well for choker-style necklaces or thicker beaded necklaces. What’s your favorite traveling necklace display? Browse more necklace bust options. Necklace easels provide great displays with a lot of ease. (You know, an EASE-l. Get it?) Silly jokes aside, this necklace display is ideal for the summer months when traveling to shows, or for setting up on a jewelry display table where you don’t have enough room for busts. Why are they so great for travel? Well, in addition to being lightweight, easels pack nearly flat, which really helps save on precious space during travel. 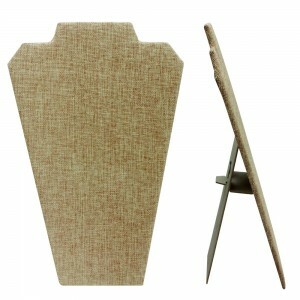 Easels are the perfect accompaniment for chains, pendant necklaces, and thinly beaded necklaces. Love to layer? Try a tiered necklace easel to create a beautiful layered look your customers will crave. You can be free to express your display style with necklace easels, as they come in a wide variety of sizes, styles, colors, and textures. What’s your favorite way to use necklace easels? Just starting out selling jewelry and wondering where to start with your jewelry displays? It can be overwhelming to think about traveling with your jewelry, setting up a booth, and creating an eye-catching display table! We know you want to get started selling your pieces quickly, so we’ve put together just a few tips to help you get started displaying. 1. As a general rule, keep display colors and styles consistent. You can do this in two ways. First, by keeping the colors and materials consistent throughout your displays (all leatherette or velvet, for example, or all light colors or all dark colors). Second, by making sure your displays compliment your jewelry’s style. If your jewelry has a summer beach feel, your jewelry would be better displayed on something like a linen display than on black velvet. Note: there is one exception to the above rule! For statement pieces, you'll want a statement display. The focal point of your display should be a display that contrasts with your other displays and stands out. 2. Use appropriate displays for your jewelry. 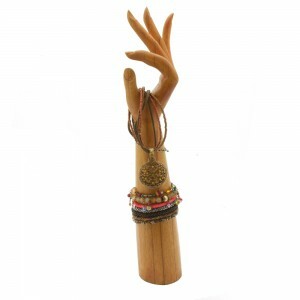 For example, would an easel or a bust work best for your necklaces? 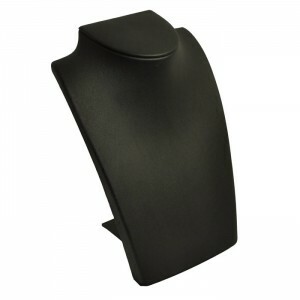 A finger or slot display for your rings? Do your bracelets work best on a T-bar, or do they need to lie unclasped on a half-moon or ramp? 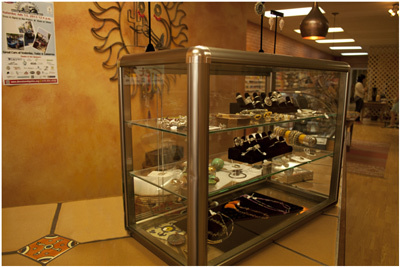 Each style of jewelry is best complemented by particular display styles (and sometimes even a mix of styles). 3. Remember to use different height levels. Keeping varied height levels throughout your display table (especially in groups of three with the “high, higher, highest” elements) will help your customers be able to naturally read your table and easily find what you have to offer. By having everything on the same level or same height, it’s more difficult to differentiate between products and your customers will have a harder time finding items–which means they may give up and look elsewhere. Although these are a few general rules that help to make displaying consistent and simple, the more you go to shows and set up your displays, you’ll figure out what works for you (and you’ll come up with tricks of your own!). Best of luck as you get started displaying! Spring is nearly over and summer is just around the corner! Our thoughts have been full of summer displays and packaging ideas and our inspiration is coming from our new burlap jewelry display line and the chevron merchandise bags. What lovely items have been your inspiration this year? The burlap jewelry displays are just dreamy… a grainy, textured surface speckled with brown and beige makes these displays overflow with charm and character. Deep jewel tones really stand out against this background (we’re talking about those purples and greens and blues), although, if we’re really being honest, just about any jewelry style will be complemented by the burlap displays. From shabby chic to indie to rustic elegance, these displays will make your style stand out even more. And those chevron bags? Can we just say y-u-m? If your head isn’t spinning with thoughts of summertime fun after looking through these bags, we don’t know what’ll get you there. They make us think of warm air, picnics on the beach, and juicy slices of watermelon. Each one of these six different colors makes us think of another summer memory. 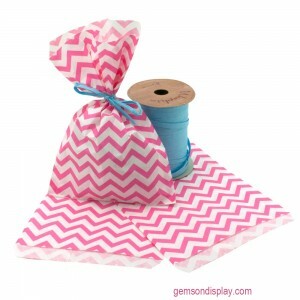 Pair any of the colorful chevron bags with either tissue paper or raffia for a cheerful summer packaging look. Pair with raffia for the perfect summer look! Let these beautiful burlaps display and chevron merchandise bags inspire your summer displays and packaging, and check out our full inspiration on our Hello Summer board on Pinterest. Packaging the items your customers have just purchased doesn’t have to be expensive or complicated! There are a few ways to package that are simple, pretty, and won’t break your budget. 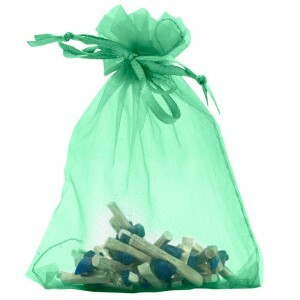 Pouches are an attractive and inexpensive way to gift wrap almost any small item. There is a lot of room for creativity or special edition packaging since pouches are available in such a wide range of colors and fabrics. 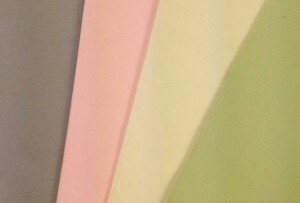 Organza might be great for spring, velvet for winter, and a metallic silver or gold for the holidays. You can also keep packaging consistent by always using an organza pouch, but changing the colors depending on the time of year. 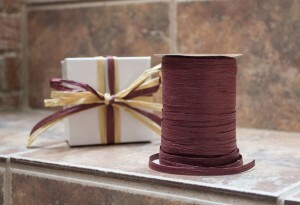 Cotton-filled boxes wrapped with raffia (or ribbon) are a great way to package! You can easily customize the colors to complement your branding, the season, product promotions and more. Another creative gift packaging idea is to wrap your products in either a colorful tissue paper or in newspaper. Like the cotton-filled boxes, this method of packaging is easily accented with raffia of ribbon. Consider using an accent color or two that will match your logo, as this will help you with branding at a minimal cost. What are some of your favorite creative ways to package?